These single and double acoustic doorsets for internal use are fire rated and available in a wide range of wood laminate finishes. They are used wherever high sound reduction performance is required between noise sensitive areas such as in private offices, hospitals and consulting rooms. Our soundproof timber doors are extremely high performance acoustic doorsets. 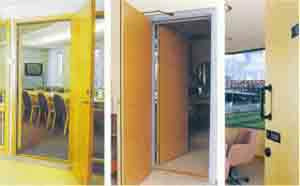 These top quality acoustic doors are available in a wide range of finishes and are fire rated. These acoustic doors are used in areas which require high sound reduction performance such as radio/TV studios, music rooms, interview rooms, cinemas etc. We are the specialists for supplying acoustic doorsets and wooden sound proof doors for all types of internal applications. If you have got a noise control problem through a poorly insulated door then we are the people to contact. Note: The term 'doorset' on this page refers to complete assemblies (including frame, seals, threshold, doorleaf and hinges). To achieve the optimum fire and acoustic performance, the acoustic doors must be supplied and fitted as complete. Acoustic Doorsets are supplied with hinges and seals pre-fitted. Handles, lockcases etc. are usually supplied and fitted by others to suit customer requirements. Veneers: Standard veneers as below. Others on request. Other sizes may be available on request. 44 dB and 41dB doorleafs are 64mm thick. 35dB doorleafs are 54mm thick. with a 30mm door stop and 90 x 20mm threshold. Deeper frame depth can be supplied upon request. All 44dB and 41dB doorsets are FD30 fire rated. and RAL equivalents are available. 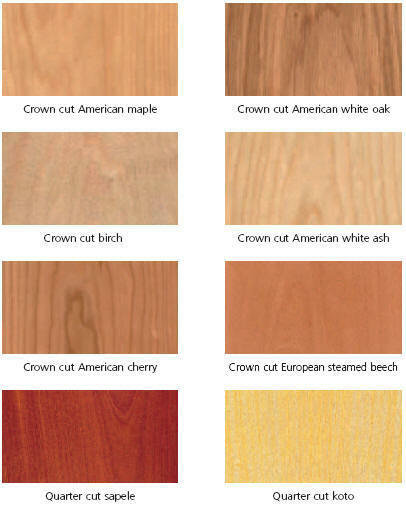 proprietary laminate ranges can be supplied at additional cost.